You guys know I love a good sound machine – and that I’m a big fan of the Conair Sound Therapy Sound Machine. It’s been my go to sound machine for the last 9 years. But last night, I noticed that it was no longer listed on Amazon (yikes)! What’s a girl to use now to help babies sleep? To say I panicked for a brief moment is an understatement. But then I remembered that I’d been testing out a new sound machine that I really enjoy – more so than the Conair. I stumbled across the LectroFan by accident a few month ago – and I’m glad I did, especially since the other one is missing in action. It’s very compact. It makes it very easy to transport. The sound for both the fan and white noise are true. There isn’t any looping like you hear in other sound machines. It can run both continuously or on a 60 min timer. It’s volume range is fantastic. I’ve only found two minor things that I don’t like about Lectrofan but which are that big of a deal with all of its benefits. It doesn’t have a battery option. 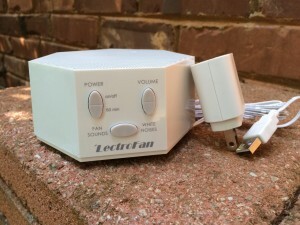 The Lectrofan is expensive with a price tag of about $49 on both Amazon and the official Lectrofan site. So there’s no need to panic like I did about the Conair sound machine not being on Amazon anymore. The LectroFan is a much better sound machine option in my opinion. It’s one I will continue to recommend to my clients from now on. Now that I have told you about the Lectrofan, I’d love to hear your thoughts on it. Have you used it? What did you like and not like about it? PS, Interested in trying the Lectrofan for yourself, you can get one here on Amazon. I used to use this machine for a long time and really satisfied with its performance. My daughter loves it very much, even she cannot get sleeping easily without its sound. Thanks for sharing. I think I will finally try a sound machine. This one seems like a good one. I am in desperate need of better sleep. I like using them when I travel for work but have hesitated getting one for home. Thanks for your review! It really is Jess. I loaned the one I had out to a client this past weekend which forced me to use my old Conair. Boy, the quality between that and LectroFan are night and day. The LectroFan is the only one I will ever use. If you do end up purchasing it, I’d love to hear how you like it. May 20, 2017. It’s now selling for $45 on Amazon. I have one and it is worth every penny. It is a fantastic machine and drowns out a multitude of sounds and noises. 10+ stars.